Prime Minister Thomas Thabane has reshuffled four cabinet ministers including former Democratic Congress secretary general Semano Sekatle who was moved to the Ministry of Public Service from the tourism portfolio. Mr Sekatle jumped ship and joined the Dr Thabane's All Basotho Convention (ABC) last December. He was immediately rewarded with a ministerial appointment in the tourism portfolio. But his tenure in the ministry lasted just two months after he was on Tuesday moved to the public service. He swapped places with the deputy leader of the Basotho National Party (BNP), Joang Molapo. Tsukutlane Au, who served as Home Affairs minister since the advent of the four-party coalition in July 2017, swapped ministries with Mokoto Hloaele who was the Minister of Energy and Meteorology. The reshuffle which also included the movement of some principal secretaries was communicated by the Government Secretary, Moahloli Mphaka, in a press release on Tuesday. "The office of the Government Secretary hereby informs the nation that pursuant to Section 87(7)(d) of the constitution, His Majesty King Letsie III has made cabinet changes on the advice of Prime Minister Motsoahae Thomas Thabane," part of Mr Mphaka's statement reads. The statement further informed the nation that Lefu Manyokole, who served as senior private secretary in the Prime Minister's office until Tuesday, had been appointed as Principal Secretary in the Ministry of Health. "Mr Kabelo Lehora will now serve as Prime Minister's Senior Private Secretary. Tieho 'Mamaisane who served as Ministry of Education and Training will now serve in the same capacity at the Ministry of Tourism, Environment and Culture while Advocate 'Mole Kumalo - who served as health ministry principal secretary - is now the Principal Secretary in the ministry of social development." The statement further noted that Ms 'Maseithati Mabeleng has been moved from her former post as Principal Secretary in the Cabinet for Economic Affairs in the Prime Minister's Office. She is now the Chief Accounting Officer in the Ministry of Forestry, Range and Soil Conservation. Her former post has been taken up by Mr Thebe Mokoatle. Lerotholi Pheko has been appointed as Principal Secretary in the Ministry of Public Service while Dr Neo Liphoto and Matela Thabane have been appointed as chief accounting officers in the Ministry of Education and Training as well as Police and Public Safety respectively. Mr Mphaka did not give reasons for the reshuffle which came against the background of the weekend ABC elective conference where Dr Thabane threatened to fire corrupt and underperforming ministers. Addressing party supporters on the opening day of the ABC's elective conference at Lehakoe Recreational Centre in Maseru on Friday, the premier said would not turn a "blind eye" to Basotho's concerns while individuals entrusted to senior positions plundered the national coffers. He also said it was clear that some of the leaders seemed to be unaware of the policies which they were tasked to implement. "I can't turn a blind eye to Basotho's concerns under our leadership. "We need to implement our policies but we have noted that there are some of us who still don't understand what our policies are all about. 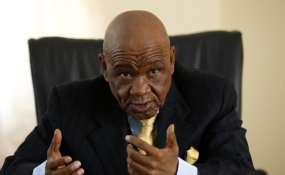 There are those who have been entrusted with senior positions in government but instead use those people powers to pursue corruption and engage in criminal activities," Dr Thabane said. However, no minister lost his job in the Tuesday reshuffle which only affected four ministers.